Christopher Smart (a.k.a. Jack, Kit and Kitty Smart) was a legendary “mad” poet, although his madness was the highly suspect result of tensions within his family, between Smart and his father-in-law, a jealous publisher who imprisoned Smart in an asylum for over five years. The poet was incarcerated again in a debtor’s prison for the final year of his life. Even with this treatment during his short adult life, he managed to produce several of the most remarkable poems of his era: Jubilate Agno and its excerpt “For I Will Consider My Cat Jeoffry,” Song to David, and The Hop-Gaden among others. Smart is primarily remembered today as a religious poet, and his madness is also often seen as the result of a religious mania of a kind that manifested itself as incessant prayer and focus on monomaniacal religious thinking. He spent a number of years affiliated with Pembroke College, Cambridge, during which time he also began running up serious debts that would plague the remainder of his life. During the time of his “madness” he was said to pray out loud and constantly, wherever he happened to be, claiming that an “inner light” connected him directly to the God of Christian revelation. 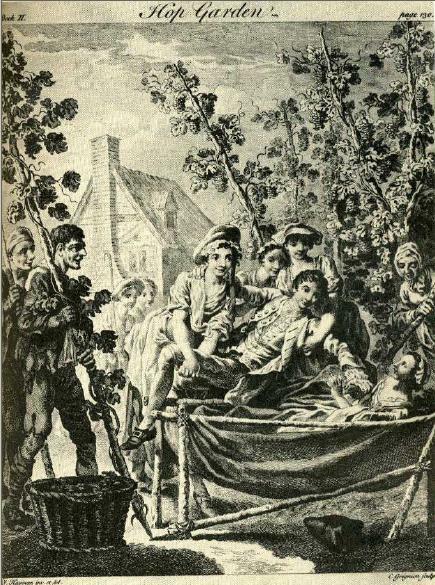 Illustration by Francis Hayman from Smart's "The Hop-Garden," in "Poems on Several Occasions" (1752). Smart was also a devoted gardener and natural historian. He refers in his writings not only to the Swedish botanist and taxonomist Carolus Linnaeus but also the ancient naturalist Pliny the Elder, even though his effort is most often to reconcile the contemporary science of his era, including Isaac Newton and John Locke, with the “truths” of revealed religion. His Hop-Garden describes an intimate relationship between mankind and the natural world, especially through the mediation of the garden. Written in mock-heroic Miltonic blank verse, The Hop-Garden adopts the Virgilian tradition in its focus on the intersection between human culture and the natural world by way of an emphasis on agriculture. In her journal, Fanny Burney described Smart as “a man by nature endowed with talents, wit, and vivacity, in an eminent degree.” Others who knew Smart focus on his charm, his wit, and his humanity. As a journalist, he befriended Dr. Johnson, Alexander Pope, and Henry Fielding, among other literary lights of London during the era, and he wrote numerous satires and parodies at a time when these genres were the order of the day. Smart died in obscurity at age 49 and much of his work was lost until the 20th century. Jubilate Agno, perhaps now his best known work, was not published until 1939. 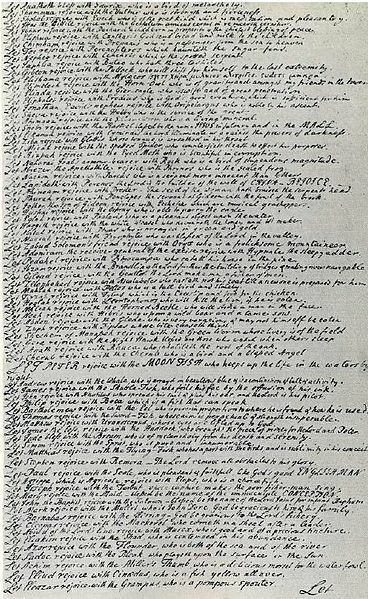 This manuscript, from Smart's "Jubilate Agno," suggests one pathology of his "madness" with its repeated "Let"-phrases (and comparable "For"-phrases) at the start of each line and an obsessively methodical quality in the actual handwriting; the manuscript goes on like this for pages. Robert Browning’s Parleyings with Certain People of Importance in Their Day: A Victorian conversation with Christopher Smart, in verse, imagined by Browning.